The leaks are coming thick and fast as we get closer to Google’s October 9th Pixel event. This time a new ‘Smart TV kit’ has appeared well before its official announcement. 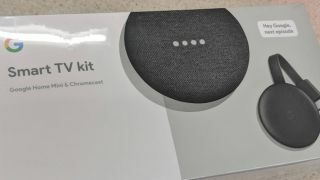 The Smart TV kit appears to bundle a Google Home Mini with the still-unannounced third-generation Chromecast, according to a pair of photos that emerged on Reddit, which have since been deleted. Unfortunately, the Redditor didn’t include any details on release date or pricing. However, there is an existing Smart TV kit you can buy right now for $74 (about £60, AU$105) from Walmart in the US and we're hoping the new version will be sold at the same price. We see little reason for the price of the Smart TV to increase, as the rumored 3rd-gen Chromecast will apparently be sold at the same $35 (about £30, AU$50) price as its predecessor. More than likely, this new Smart TV kit will also be a Walmart exclusive available only in America – sorry UK and Australian-based readers. Considering the spate of leaks we've seen concerning the Pixel 3, Pixel 3 XL, Pixel Stand, Chromebook Slate and Home Hub, it seems like we already know pretty much everything Google could possibly announce. Of course, there may be some surprises, so stay tuned for our live coverage from the event next week.